Transonic flow occurs around moving objects as they approach and cross the sound barrier. Serious problems can occur at this point, such as shock-induced flow separation which can cause the aircraft to spin out of control. Another important practical problem is the achievement of higher aerodynamic performance of aircraft at cruise conditions, which leads to considerable fuel savings. The success in application of numerical methods for simulation of transonic flow and aircraft design depends on developments in the underlying mathematical theory. This book presents a breakthrough in the solvability analysis of boundary value problems, which makes it possible to establish convergence of finite element approximations for shock-free flow and to provide a framework for putting the existing numerical methods on a more sound basis. Also, physical aspects concerned with patterns of formation and propagation of weak shock waves are analysed. This contributes to the understanding of the extreme sensitivity of transonic flow to perturbation of freestream conditions. The developed theoretical knowledge base yields promising concepts of the airfoil design and active flow control by airfoil/wing shape modifications or suction/blowing through a perforated surface. * Focuses on Computational Fluid Dynamics. * Addresses practical problems, such as airfoil design and flow control. * Presents developments made in the last two decades. In essence this is a much needed monograph for researchers and engineers in applied mathematics and numerical analysis applied to aerodynamics and for algorithm developers in Computational Fluid Dynamics in the aircraft industry. It gives design engineers the underlying mathematical theory necessary for developing new concepts for airfoil/wing design and flow control. 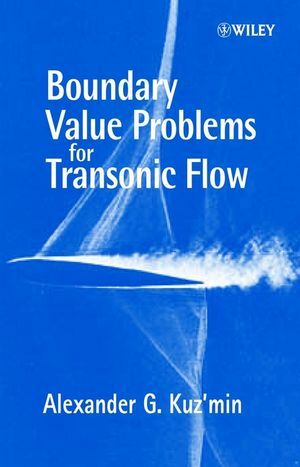 Alexander G Kuz'min is the author of Boundary Value Problems for Transonic Flow, published by Wiley. 1. Linear Partial Differential Equations of Mixed Type. Solvability of a Basic Boundary-Value Problem. Equation of the Elliptic-Hyperbolic Type. Equation of the Hyperbolic-Elliptic Type. Equation with a Local Hyperbolic Subdomain. 2. Flow That Accelerates from Subsonic to Supersonic Velocity in a Channel. Solvability of a Nonlinear Pertubation Problem. The Full-Potential and the Chaplygin Euqations. Acoustical Oscillations in Transonic Flow. Flow with a Local Region of Deceleration. 3. Flow with a Local Supersonic Region. Particular Smooth Solutions and Shockless Airfoils. A Modification of the Frankl Problem. Concepts of the Arising of Shock Waves. Flow with a Local Supersonic Region over a Porous Boundary. Flow that Decelerates from Supersonic to Subsonic Velocities. FE and FE Treastment of Flow with Shock Waves. 4. Numerical Simulation of Transonic Flow Patterns. Formation of Shock Waves in the Local Supersonic Region. Inrteraction of a Shock Wave with the Sonic Line. Off-design Conditions and Flow Control. Other Studies Concerned with a Flow Structure.